I currently have a Taye Rock 5 piece. I'm interested in your thoughts about the Taye drum set versus Gretsch Catalina Maple Fusion Shell Pack with a Free 16 Floor Tom....6 piece. Would it be a worthwile upgrade with the 6 ply maple versus the 9 ply birch-basswood? Or would it be best to stick to the Taye that I have and add the extra floor tom that is consistent with my set. It's not as much a money question; it's the sound and quality of the drums that I seek your advice. ***First of all, you might want to consider the difference in drum sizes in a "fusion" set. Many drum sets come in two different configurations, Standard or Fusion. The drum diameters distinguish each configuration. Fusion drum sets typically feature 10" and 12" mounted toms, a 14" floor tom (suspended or standing) and usually a 22" bass drum. Standard-sized kits feature 12" and 13" mounted toms, a 16" floor tom, and 22" bass drum. The benefit of the smaller diameters of the Fusion set is their punchy tone and articulate sound. The benefit of the Standard size set is that the larger toms produce more volume and bigger tone. Which type of set you choose depends upon the sound you want and where you will be playing the drums. Maple shells naturally have long and slow sustains ratios causing a warm and resonant tone throughout the drum. Birchwood shells tend to contain opposite tonal properties from maple. Birch naturally has short, fast sustain ratios causing a higher pitch and greater attack velocity. Birchwood is also very inexpensive and readily available--used more on lower end sets. Again, it depends on the sound you want. In general, the more plies a drum has, the rounder and fatter the sound. 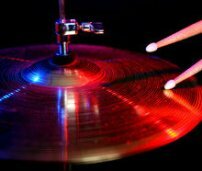 Drums made with fewer plies usually have a brighter, more resonant sound and a lower fundamental note. Whether the warmth of the Maple is enough to offset the fewer ply layers, I don't know. It could be that the 6 plies in the Maple might just add some brightness to the tone. From all the reviews I have read, it is kind of a toss-up. Both sets are in the same basic price and quality range. So----I guess it comes down to the size of the drums and whether you think that the lower ply number would offset the warmth of maple to a significant degree. (If the warmth of Maple is what you are after). You might also consider what it will cost you to upgrade and whether the cost is worth the difference. It might be that you could keep the Taye set and use the $ for a new Tom AND cymbals or heads or other accessories. Hope this helps. It is such a personal decision.